For the Baltic States, WWII did not end on September 2, 1945. Lithuania, Latvia, and Estonia were still occupied by Soviet forces. The Forest Brothers, composed of 30,000 Lithuanian, 22,000 Latvian, and 14,000 Estonian men and women became the 20th century’s largest armed resistance. Learn more about this little known piece of history of the Baltic States’ struggle for freedom. The Forest Brothers are so called because they took refuge in underground bunkers and tunnels dug in dense forests. They survived these challenging conditions by staying underground throughout winter and receiving food and supplies from farmers. Many of the resistance fighters had no military training, yet they quickly showed Soviet forces that they would fight for their country and their freedom until their death. The Forest Brothers actively fought the Soviet army from 1948 until the late 1950s or early 60s. Many partisan fighters were killed by the Red Army and those that were captured were sent to hard labor camps in Siberia. By the early 1950s, the Forest Brothers began receiving supplies and assistance from the British and American governments. This support assisted the partisans’ fight against the KGB. 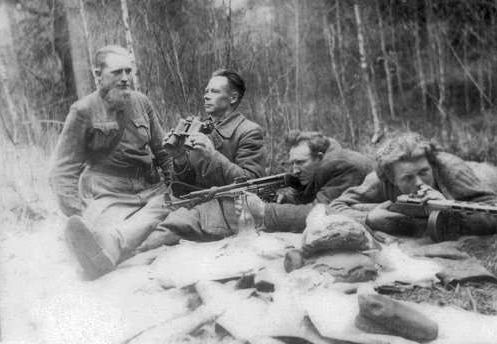 Despite the partisans efforts and minor assistance from the West, the Forest Brothers were not successful in gaining their freedom – which would not be won until the 1990s. Partisan fighting lasted for more than 10 years, had an estimated total of 50,000 casualties, and the Soviet Union still occupied Lithuania, Latvia, and Estonia. Being the largest and most populated Baltic State, Lithuanians played the largest role as Forest Brothers. It is estimated that one in 10 Lithuanians were either active partisan fighters or supplied food, medical aid or money to the fighters. Lithuanian Forest Brothers actively published and disseminated underground articles and information about their resistance movement. One of the strategic planners, who had no formal military training, was Juozas Luksa. Luksa became one of the most prominent Lithuanian partisan fighters and also the number one on the Soviet Union’s most wanted list. Luksa traveled to Western Europe twice during this time to try to gain assistance from outside forces. Juozas Luksa’s account of these times can be read in his novel entitled Forest Brothers: the Account of an Anti-Soviet Lithuanian Freedom Fighter, 1944-1948, which he recorded after he fled Lithuania. In the 1950s the story of the Forest Brothers became mistrusted in popular opinion largely due to the propaganda efforts made by the Soviets . However, in 1989 as Lithuania was still actively fighting for freedom, a Lithuanian reporter, Elena Tervidyte, interviewed surviving Forest Brothers. Following Tervidyte’s article, movies and books have been released about the Forest Brothers and the truth has slowly emerged, though this long battle still remains largely unknown outside of the Baltics. Though many stories remain untold, Lithuanian, Latvian, and Estonian nationalism remains alive today and the story of the Forest Brothers will not be forgotten.